We are a small team made up of people with lived experience of Autism and Carers. We want to help our community have a better understanding of what it is like to live with Autism and the effects it can have on our lives so that together we can build and Autistic friendly community. 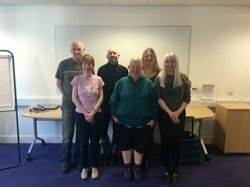 Disability Sheffield has once again secured some funding from Skills for Care to enable us to offer a programme of free training courses from July 2018 – February 2019. A summary of the courses currently available free of charge to IEs and PAs can be viewed here. Further information on how to apply for other training opportunities through the Sheffield Development Hub and Sheffield City Council’s full training directory is available on the Council’s website . Disability Sheffield also facilitates the Individual Employer and PA Development Group. The group meets on a quarterly basis and works in a fully co-produced way to identify develop and implement learning opportunities and resources for IE and PAs in Sheffield. The group is open to anyone. If you would like to join Tess Daly by e mail tess.daly@disabiltysheffield.org.uk or phone Disability Sheffield on 0114 253 6750.